Acoustic guitars, analogue rythm boxes and synths, and a delicate voice are the basic elements that form Cor Blanc’s songs. Mireia Bernat and Sergi Serra Mir, Cor Blanc, are placed in the dreamy side of pop. Cryptic lyrics surrounded by an unreal atmosphere of delicate rythms and folk pop melodies. Pròleg en Fred is their first release. Eight home recorded songs that submerge us in the mysteries of love and desire. 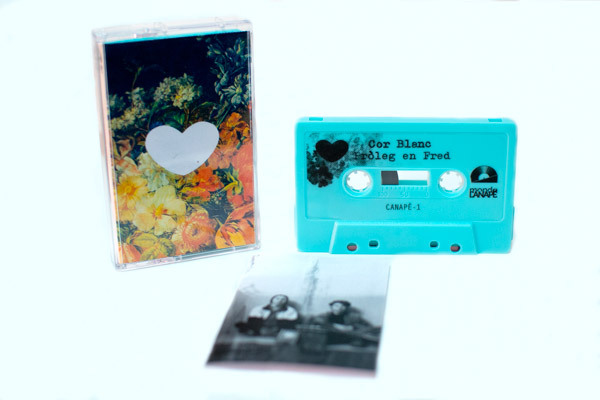 The album is the first release of the new Spanish cassette label Mondo Canapé, a label dedicated to lo-fi sounds of all genres from young bands around the world.